Quarter Barrel Sign is handcrafted out of white oak with steel rings. Can be personalized with Name, City, State, and Year. Complete with Hanging Hardware. *Please note the word "Estates" is not automatically included in line 1. The entire line is personalizable. Please specify if the word Chateau is to be included in the permanet text. Can I exchange the vineyard picture for the winery and bistro picture? Is the lettering and image painted on or engraved into the wood? 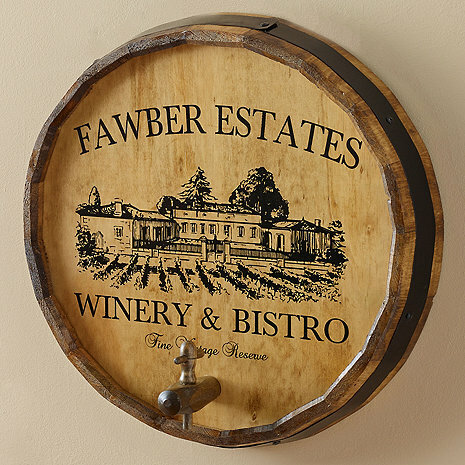 BEST ANSWER: The Personalized Vineyard Estate Barrel Head Sign is a beautiful piece but the personalization is not carved. We offer a deep carved barrel head. They are painted on or embossed...not engraved. But it looks nice! No it is not engraved. But, it is beautifully painted! Can I have a photo engraved in the wood? this piece is only 3.5 inches in height? Is that accurate? that would make it quite tiny. BEST ANSWER: That is actually the thickness of the piece. Great quality product. All of our friends are impressed. Very low quality. Yellow picture of wood on front look horrible. I really do not like this at all. It has a fake yellowish picture of wood on the front and looks terrible. I will not use it because it looks so cheap. I’m very disappointed and because it’s cusrtonized not sure I can return it. Ordered this for a gift. It is so much better than I imagined! Looks like a full-sized barrel end, nice and bold. The printing is nice and clear as is the picture. The only thing I noticed was a dent in the face of the wood, but it actually adds to the character. Our friends are going to love it! It was delivered in excellent condition and looks terrific above the 84 bottle wine jail. Like everything about it. Hangs in our dining room, get great responses to it. Received in very timely manor and only had to glue in spout. Would recommend and may order another as a gift. The wall sign arrived on time. It looks authentic and I am quite pleased with it on the wall of my wine display. This is my second purchase after ordering one as a Xmas present. I was impressed so I got one for myself. I can't say enough nice things about this Barrel Head Sign. The personalization was perfectly done. Even though I was informed that the gift might come after Xmas - It showed up several days before. Everyone who sees it (even non-wine drinkers) thought it was perfect. The recipient - reaction, priceless. Great conversation piece... I would definitely recommend it to others! Nice piece ! I put another 3 coats of polyurethane on it and it really pops! I would highly recommend Wine Enthusiast. Good high quality products. I bought this for my wife as a gift and she couldn't be happier. Everyone who sees it is impressed with it. A definite good buy. Impressed with this product! Very nice quality. It will be beautiful in the Polish winery. Very nice quality product! It looks like an authentic wine barrel was used. The etching is well done and very legible. First off there is nothing I can say against this product. My husband and I are very pleased. Everyone who has seen it is just amazed with the quality. This is one thing I can say that I bought that I was not disappointed in, and trust me that does not happen to often. So I thank you for bring my kitchen to life. This was easy to order and came wrapped in a heavy box. This was one of the best items I every received in a timely manner and made of high quality material. It fit perfect in my new wine bar. I am very please and would recommend this. Order was received quickly and was very well done. It’s a Christmas present and are anxious to see it opened! Good idea, just “OK” quality. The personalization idea is great. We ordered one first than 4 others with references to each of our children’s names and their birth dates. The materials could be moved up a notch on quality but they’re OK. Have a little trouble with the staves shrinking and getting some spaces between some of them thus making the metal bands look a little loose. Overall, just OK, if you’re looking for something high end quality order something else.